Indian society consists of many casted. Not all castes have the same status, and this has given rise to the breeding ground for caste related injustice towards individuals. The first cry towards the need for eradicating such injustice was given by Dr. B. R. Ambedkar. He propagated the thought of society that will not be divided on caste related matters. To give a boost to this thought, the central government has implemented the Dr. Ambedkar Scheme for Social Integration through Inter-Caste Marriages scheme. Under this welfare program, government will provide encouragement to couples who have opted for inter-caste weddings. This scheme was launched in 2013, and the Prime Minister of India Mr. Narendra Modi made the official announcement of this program. He was accompanied by his ministers as well. All activities and operations of this scheme will be looked after by the Social Justice & Empowerment Ministry of Indian Government. They, along with the head of Dr. Ambedkar Foundation will have the final say in respect to changing any scheme features or the beneficiary selection process. You can get more information from here http://ambedkarfoundation.nic.in/html/index.html . Encouraging the practice of inter-caste marriages – Indian society can only develop and progress if the curse of caste inequality is removed forever. The implementation of this program is a step towards achieving this goal. Incentive schemes like this will encourage younger generation to take such progressive steps. Assisting young couples with money – Couples who opt for inter-caste are generally shunned by their families due to the rigidity of the caste system in India. They often face hardships, but with this grant, these couples will no longer have to worry about facing financial adversity during the initial days. Funded by the central government – All operational activities and financial requirements of this welfare scheme will be met for the coffers of central government. Money will be sent to each start or UT for its implementation. Bringing equality among all castes – The main aim of this scheme is to give a level ground to all castes. With this, the central government will be able to bring about equality among all castes, thereby eliminating caste related prejudices. Total number of beneficiaries – As of now, the central government has announced that it will offer this grant to a total of 500 couples. These couples will be selected from all states and UTs. This selection will be done based on the percentage of SC population in each of these areas. Monetary grant for the couple – If selected, every couple will stand a chance to receive a whopping 2.50 lakhs from the central government. This grant will be awarded in two separate installments. Implementation on pilot basis – Initially, the central authority took the decision of implementing this scheme for a term of two years. If it succeeds in meeting the objective, it will be given regular scheme status. District authority will arrange the wedding ceremony – It will be the responsibility of district authority in each state or union territory to arrange a formal ceremony and handover the money to the beneficiaries. The respective department from central government will dispatch Rs. 25,000 in favor of the local administrative body. This sum will be provided for every couple who gets the grant. The money will be given in parts. The very first installment will be given in the form of a DD by the state authority. This DD will contain half of the total allocated grant. Once the couple stays together for a period of 5 years, only then will they be given the rest 50% of the grant. The marriage should be inter-caste in nature – The draft of this scheme states that either the boy of the girl must have schedule caste certificate. If the boy belongs to SC caste, the girl must not be from the same caste, and vice-versa. Bride and groom must attain legal age – If the age of the girl is below 18 and the age of the boy is below 21, they will not get approval. In other words, each must have completed their legal age for entering a nuptial relation. The application must be done within one year of marriage – The interested and deserving candidates will have to make the application before they complete one year of marriage. Income related criteria – It has been specified that the total income of the wife and the husband, on a yearly basis must not exceed a mark of 5 lakhs. If any one partner is employed, he/she must not earn more than this amount as well. Marriage according to Hindu Marriage Act – The marriage must follow all rules which have been highlighted in the Hindu Marriage Act, under the Constitution of India. Grant for first marriage only – this welfare scheme is only applicable for girls and boys who are getting married for the first time only. In case any of the two were married earlier, they will be barred from getting the financial grant. Identification proof of the couple – The application form must have the names of both bride and groom. To authenticate these claims, the applicants must provide photocopies of their identification documents. The Aadhar card, ration card, driving license, voter card or PAN card will do. Residence proof of the couple – Along with providing details of their personal identification, the applicants will have to attach photocopies of their residential certificates to highlight the state from where they originate. 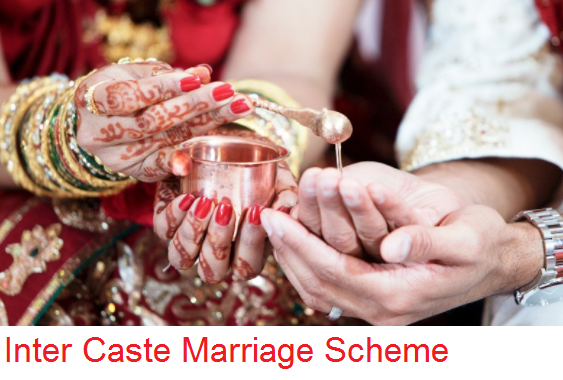 Caste certificate of the couple – As this scheme is mainly to promote caste equality; both the bride and the groom will have to provide their caster certificates. One of them must belong to SC category. Age certificate of the couple – Attaching the age proof of both the husband and the wife is required. It will assist the verification committee in making sure that each candidate was an adult when the marriage took place. Income certificate – As there is an income related criteria, the couple will have to furnish income certificates with the seal of the local authority, to support its authenticity. If both partners are employed, each will have to provide a separate certificate. Certificate of first nuptial – As only first timers will be allowed to get this financial assistance, they will have to produce documents, which will support that fact that neither the man nor the woman has been married earlier. Marriage certificates – Only applications made within one year of marriage will be accepted. Tracking this will become easy for the verification officers with marriage certificates as dates are mentioned on this paper. So, this certificate must be attached. Details of joint bank account – The financial grant will be deposited in the account that has the names of both the bride and the groom. The money will be given to both of them. Thus, name of the bank and the specific branch, account number, branch code, IFSC code etc must be provided. Recommendation letter from regional authority – With these papers, the applicants will also have to provide recommendation letters, which have been issued, wither by the MP or the MLA in that area. A recommendation letter from the Chairman of Social Welfare Department of that state or union territory, District Collector or District Magistrate is needed. Offline registration procedure has been made available for interested candidates. But for this, they need to acquire the registration form. For this, they need to log on to http://ambedkarfoundation.nic.in/html/schemes/Dr.%20Ambedkar%20Scheme%20for%20Social%20Integration%20through%20inter-cast%20marriage.pdf. After the candidate has downloaded the application form, he or she will have to get a proper print out. Every information about the couple is required. Thus, this form must be filled accordingly. All important legal papers must be attached as well. With this welfare scheme, Indian government will not only provide assistance to young couples with financial grant to start a new phase in their lives, but will also take a proactive step towards ridding Indian society from the menace of caste inequality and related prejudices. In 2016 – 2017, 170 applications were submitted for getting the benefits of inter-caste marriage. This year, the number has gone up to 210. All young couples, which apply under the inter-caste marriage scheme, will receive financial assistance of Rs. 50,000 to start this new chapter of their lives. Such reformative projects will come in handy to wash away the illogical societal concepts.